Traverse City, MI-In the watchful eyes of the Centers for Medicare and Medicaid Services, urologist Michael Harris, MD, does not exist. Dr. Harris-a successful, board-certified urologist in private practice-would not have it any other way. Next month will mark the 1-year anniversary that he took the bold step to completely opt out of the Medicare program, a decision relatively few physicians have made but perhaps many dream about. Among urologists, Dr. Harris appears to stand alone as the only active member of his specialty to have dropped out of the nation's insurance program for the elderly and disabled. His decision to make a clean break from Medicare and all it represents may draw the envy of urologists who have grown tired of the program's administrative burdens, endless regulatory oversight, and threat of audits. But for Dr. Harris, the move was actually the second major step in performing what he terms an office "administrative-ectomy." Three years ago, he discontinued all commercial insurance contracts. His solo practice, Northern Institute of Urology, is essentially a cash-and-carry business. "This is pure, private medicine," Dr. Harris said. "I love my career. The patients that choose to see me are grateful for my expertise and care. All others go elsewhere. A practice could not be more enjoyable. I'm no longer a slave to the Medicare treadmill." Dr. Harris, 44, detailed for Urology Times the reasons for his moves, how they occurred, and their impact on both his professional and personal life. He said they did not happen overnight, nor did they come without risks. Nevertheless, he has few regrets and encourages other urologists to follow his lead. Taking care of business Like many physicians just out of training, Dr. Harris knew little about the business of running a medical practice. After serving 4 years as chief of urology and an instructor at Air Force hospitals in Florida and Texas, he returned to his home state of Michigan in 1993 to join the urology practice of Tom Hall, MD. Dr. Hall, who was 2 years from retirement, showed little interest in the business of medicine, said Dr. Harris, who took control of the practice in 1994. "I evaluated the business side of the practice step by step and found that, when you do your own accounting and have an accountant check things every 3 months, you learn where the money's coming from and where it's going. You end up becoming very efficient at streamlining the process to provide more efficient care," he said. Despite his efforts to make the practice more efficient, Dr. Harris became overly busy and bogged down by the administrative hassles wrought by government and commercial insurance. He decided to do something about it. Over a 5-year period, he took a number of steps to simplify his practice, cut overhead, and focus more on patient care and research. In 1996, he left the Medicaid program. "The administrative burden to deal with Medicaid exceeded what they paid me. It would cost me 30 cents on the dollar to get paid 25 cents on the dollar," he said. "I lost less money by doing it for free." Excerpt from a Medicare private contract, which is required for use by "opted-out" physicians seeing Medicare beneficiaries. Stepping away from Medicaid did not provide the relief Dr. Harris was looking for. He remained exceedingly busy. He became fed up with the administrative oversight of his commercial carriers, the Blue Care network and financially strapped Northmed HMO (the latter was eventually sold to Priority Health). The final straw came when capitation began working its way into the Michigan market. By 1998, Medicare was the only insurance program in which he participated. He had stopped signing commercial contracts. "I wanted nothing to do with capitation," Dr. Harris said. "I felt that it was an unethical way to practice medicine. And I did not feel like I needed to continue to cater to unfavorable contracts." With three young children, a mortgage, and the specter of a declining patient base, Dr. Harris did not proceed without caution. He began requiring that patients sign a contract before any surgery, making clear the diagnosis, the nature of the procedure, the charge, and the expectation that they would pay him in full within 30 days. But too many patients failed to pay, and attempting to collect became a burden in itself. "I had to continue to have billings and collections staff to deal with this," he said. "I was also submitting claims to commercial insurance on behalf of the patients, but I was getting stiffed because I wasn't collecting in advance." Pre-paid surgery A partial solution was the mandate that all patients pre-pay for elective surgery, a policy that remains in effect at his practice. The policy does not apply to emergency room care, which Dr. Harris says now constitutes his only source of accounts receivable. "Some patients balked," he said of the pre-payment policy. "But as a general rule, when people know what the policy is upfront, there's no question. When they come in here, they know that I don't interact with insurance companies. If they want care, I'm going to offer them the best cost-effective care I can, and I expect to get paid." The number of so-called "opted-out" physicians is difficult to determine. A spokesman for CMS did not respond to a request for an interview. The American Medical Association cites anecdotal reports of physicians opting out but does not have an exact figure. Kathryn Serkes, a spokesperson for the 4,000-member Association of American Physicians and Surgeons (AAPS), which is devoted to "the protection of the sanctity of the patient-physician relationship," has said in a press release that "hundreds" of physicians have opted out of Medicare. The AAPS, of which Dr. Harris is a member, actually encourages physicians to leave the Medicare program and provides instructions on how to opt out on its web site (www.aapsonline.org). Urology Times was unable to locate other urologists who have opted out. "The cause is not money in most cases," said Serkes, who cited issues related ethics, patient access, freedom from government control, and "freedom to practice medicine again" as the primary reasons physicians opt out. In Dr. Harris' case, those were the exact reasons. "I was getting paid less and less every year, and I was getting more administrative burden," he said. "Then Medicare increased their audit patrol for coding. As long as you sign a contract with a commercial or government third-party payer, you are susceptible to a federal audit and criminal penalties for the auditor having a different opinion about coding. "I decided I wanted to practice medicine, not administration." Physicians were given the option to opt out and enter into private contracts with their Medicare beneficiaries under a provision of the Balanced Budget Act of 1997. 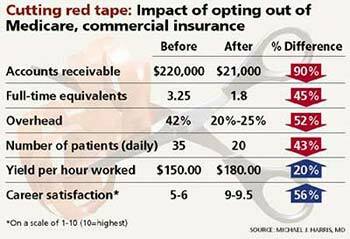 Those who opt out agree not to see any Medicare patients (barring emergency services), except for those with whom they have entered into private contracts, for at least 2 years. An opt-out affidavit must be filed with the physician's Medicare carrier; a template is available on the AAPS web site. New affidavits and private contracts must be completed every 2 years. Once a physician opts out, future payments must be out of pocket. Medicare will not reimburse for services, nor will any supplemental Medigap policies, although patients may submit claims to a secondary insurance carrier that is not a Medicare supplement. Dr. Harris said Medicare allows him to bill for emergency care rendered while on call as a non-participating provider, but for emergency care only. "I choose to not bill Medicare because I do not want to violate my freedom from [CMS] or HIPAA. As a urologist on call, I do not provide very much free emergency care," he said. The process of opting out is fairly simple, according to Dr. Harris, but there are challenges that go along with it. He estimates that his overall income is down about 30% from his pre-insurance days, although his overhead is considerably lower. And he said Traverse City's three other urologists-all Medicare participating providers-have gained a "large portion" of his practice. "By creating a hassle for patients, I have alienated some referring physicians. A urologist [who opts out] must be comfortable with not being the busiest guy in town and self assured when business is slower than he/she is used to." His decisions about insurance coincided with a streamlining of office procedures. In February 2001, he began using a program, Iatroware, that Dr. Harris calls the "Holy Grail" of office software. It performs billing, scheduling, and electronic medical records. It allows him to print lab orders, x-ray orders, prescriptions, progress notes, and letters, all from the exam room. Over 3 years, the practice went from having 3.25 full-time equivalents to 1.8, and overhead has dropped from 42% to 25%. He said he also learned the importance of marketing to attract patients and recently began placing informational ads in the local newspaper to educate people about PSA testing and stress incontinence. And he sent a letter to referring physicians explaining his payment policies, emphasizing the fact that patients may file their own claims if they have commercial insurance. The letter also discussed the clinical research aspects of his practice (he has performed more than 600 radical prostatectomies and specializes in the perineal approach) and his office reform efforts (his articles on health care reform are posted on the practice's web site, www.northernurology.com). "Some of my referring doctors thought that commercially insured patients could not get reimbursed. They found it very difficult to justify sending patients who were totally out of pocket," Dr. Harris said. "Commercially insured patients usually get paid in full because my charges are typically less than Blue Cross's charges for office work, a little higher for surgery." Dr. Harris' charges compare favorably with Medicare national averages for non-participating physicians, ie, those who do not accept Medicare assignment. Asked for his charges for three common CPT codes, he provided these figures: 99213, $57; 99203, $132; and 99243, $137. He said he lowered charges 3 years ago on common procedures including prostate biopsy, lithotripsy, pubovaginal sling, cystoscopy, and urethral dilation, but will likely increase some fees next year. In talking to Dr. Harris, the loss of some patients and a corresponding loss of income have been worth the renewed enjoyment he has for practicing medicine. He now devotes his increased time to family life, recreation, and research. He is free from the prospect of Medicare audits, HIPAA's privacy laws, and the use of CPT codes. "I used to rush through 35 patients in a day. Now I enjoy 20," he said. "I work less, and I make more per unit time at work, despite charging less. I'm writing papers. I travel internationally demonstrating my [perineal prostatectomy] technique. It's stuff I enjoy doing."